Mark Ford, renowned educator, performer, and Coordinator of Percussion at the University of North Texas, has assisted with the development of these two lines of Innovative Percussion solo marimba mallets. 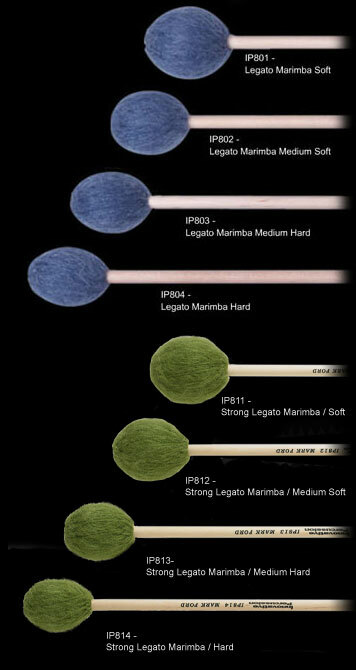 Legato Series – Using a variety of rubber cores combined with an extra-soft yarn, the results are a series of mallets that produce a legato tone at all dynamic levels. Strong Legato Series – This series features larger rubber cores for a full tone and stronger fundamental, while still using an extra-soft yarn to produce legato tone at all dynamic levels. All eight models feature natural birch handles, allowing the player additional control in demanding performance situations.